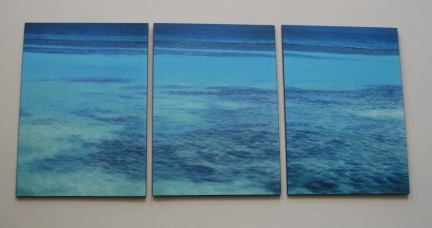 Diptych, triptych, multi - images, chairs and cut-outs don't fit into my tidy categories. This was taken midday of the waters off Ocho Rios, Jamaica. These can no longer be exactly reproduced. Detecting the reasons why took me a long time. I am caught between the changing film, paper; other new development technologies. Unfortunately, I can no longer get optical 20x30 copies, and the digital reproductions don't faithfully reproduce the original image, but I keep trying. This triptych captures snow in the dawn hours.. This photo was taken in Montana. I like the real/fake/real/fakeness of this image. This 4 x 6 photo and it's male equivalent is a celebration of the respectful attitude in Vermont for the individual. The subject of beauty has long fascinated me. As a scabby kneed girl with dandelion fluff hair, I remember trying to be “pretty”. The new Tonette didn’t work, (I did get an amazing afro though). The “Beauty Parlor” was a fraud; finger waves didn’t make me pretty. When I developed breasts, I got something but it wasn’t ‘pretty’. Just a whole new set of questions. Somehow I think it is all connected ultimately with being loved, for exactly who/how we are. Doesn’t it get mucky, the confusion and fun of lust and love? Aging brings on another set of questions. My current thought is that we’re often beautiful……. and it varies. And what about cultural standards?